When you first start working out, exercising multiple muscle groups together lets you move through a full-body workout quickly without sacrificing results. These exercises also shorten the inevitable learning curve when you first start strength-training, and prepare you for real-world activities, like moving boxes at work or playing with your kids. Women can do full-body pushups, just like men. But if you're just starting out, try an easier variation of this chest, arm and shoulder exercise. Instead of doing pushups with your hands and feet on the floor, place both hands on the edge of a weight bench, then walk your feet back until your body is straight. Do pushups from this position. Move your hands to progressively lower surfaces as you get stronger, until you're doing full pushups on the floor. Pullups are an excellent back, arm and shoulder exercise, but require a good strength-to-weight ratio. Dumbbell rows are more appropriate for beginners of all body types, yet challenging enough to remain a staple of your ongoing workout routine. Place one knee on a weight bench and bend forward from the hips, back flat. Support your upper body with one hand on the bench and hold a dumbbell in the other hand. Draw the weight up alongside your body, then extend your arm straight back down again. 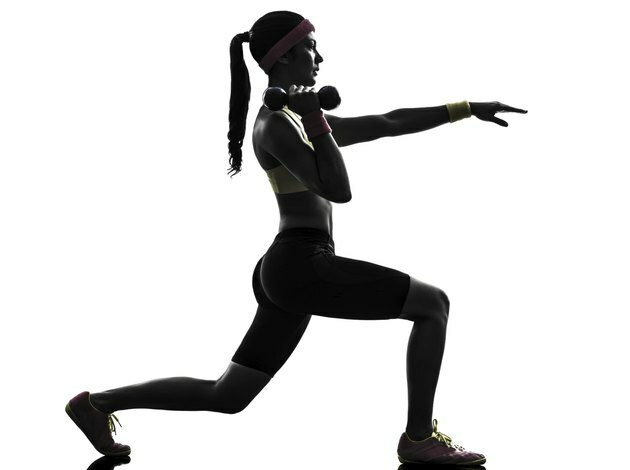 Lunges work your entire lower body, including hips, thighs and calves. Take a large step forward and bend both knees, then check your form in a mirror. Both knees should be bent at 90 degrees, your back knee should be directly below your hips, and your back heel should come up off the floor. Imagine a string that runs up your spine, out through the top of your head, and pulls you upright as you press off with your front foot and return to the starting position. Do lunges with no extra weight at first; once you've perfected the form and built some strength, you can carry small dumbbells for extra resistance. According to research sponsored by the American Council on Exercise, stability ball crunches are one of the best all-around abdominal exercises. As you gain strength, endurance and experience, you'll also be able to put the stability ball to work for a number of other challenging core exercises. For now, sit on the ball and then slowly lie back as you walk your feet forward. Stop when the ball supports your back from hips to shoulders. Squeeze your abs, flexing your spine as for a normal crunch. The ACSM recommends training the major muscle groups two or three times per week. As a beginner, start with light weights and gradually increase the amount of resistance as your strength level increases. Aim for two sets of eight to 12 repetitions of each exercise. Gradually work your way up to four sets of 10 to 15 reps. Allow your muscles time to recover with a minimum of 48 hours between workout sessions.